Have you noticed that fashion-led outfits are currently looking very grown-up? Think off-duty Princess Diana and you’ll be on the right track. In fact, I was tempted to call this look ‘conservative chic’, but I think it’s best to avoid any political connotations right now!! Blazers, feminine blouses, ditzy floral dresses, a-line skirts, block or kitten heels are everywhere. Previously I would have eschewed this look for not being ‘edgy’ enough, but it’s how you wear it that transcends it from prim and practical to sassy and sophisticated. 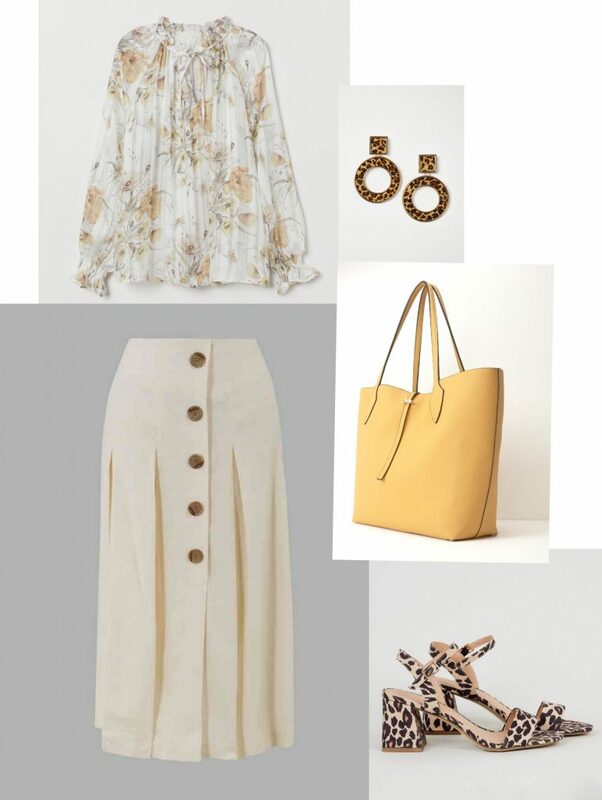 Grown-up chic is a great look for us 40-somethings as it’s none too daring and generally the pieces are comfortable to wear! 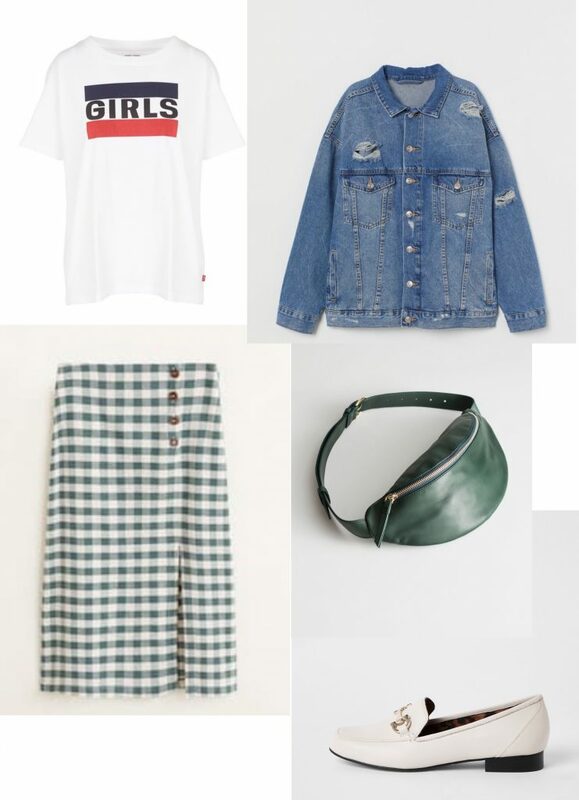 But to avoid looking like Granny, here’s some outfit ideas that incorporate sensible pieces into fresh head-to-toe looks for Spring. 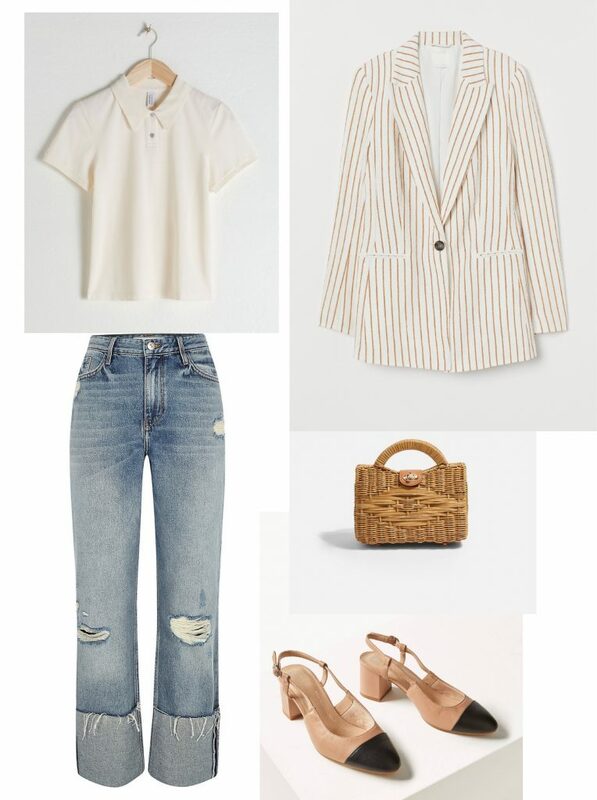 The blazer, polo t-shirt and shoes in the outfit below are quite preppy, but teamed with the latest distressed, turn-up jeans from River Island adds that all-important louche factor and brings this whole ensemble up-to-date. I love this look – it’s clean and simple! 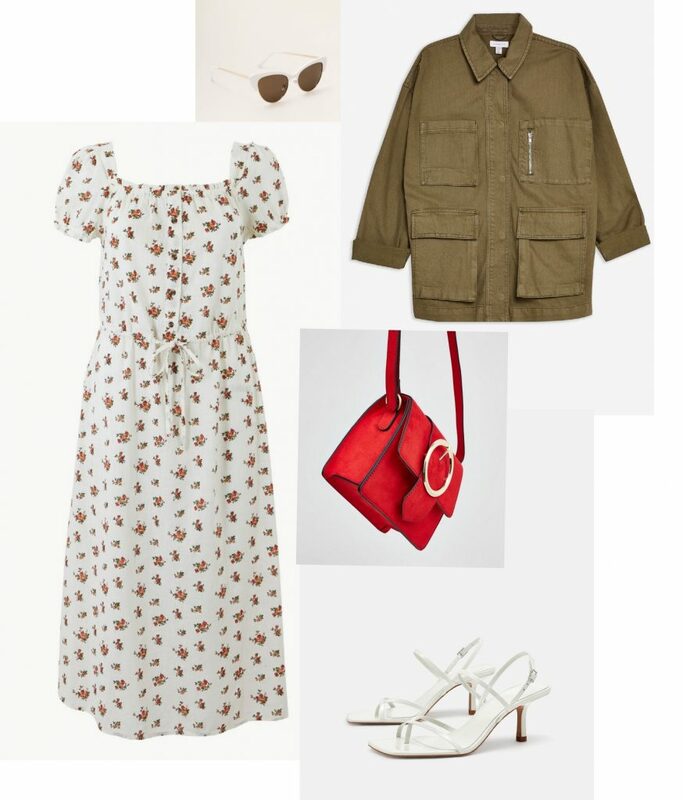 This floral dress below from Marks and Spencer is all kinds of pretty and house-on-the-prarie-cutsie so to make it less so; add a utility jacket, some cool shades and barely-there sandals. This wrap blouse with ruffle sleeves from Top Shop is very pretty. 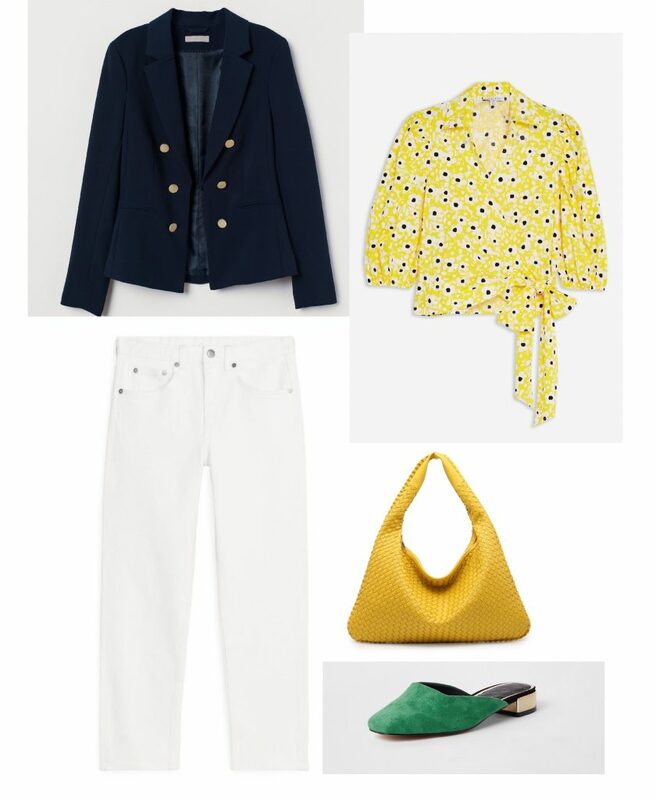 To stop it looking too prim, keep the outfit fresh by continuing the bright colour theme with bold accessories and on-trend white cropped jeans. Gingham is back on trend this season and this midi-skirt from Mango looks great teamed with loafers. To toughen-up the look, add an oversized denim jacket and a belt bag – worn across the body. Polka dots are always classic and have an air of sophistication about them. This pyjama style shirt from Zara is a fab shape and will look chic tucked into classic wide-leg trousers. Add bold, statement accessories. I’m all for block heels as a sensible and comfortable shoe option; thankfully they are having a revival right now. Pale, floral blouses with feminine touches like this one from H&M below can look prissy, so offset pastel or neutral tones with animal print. I hope you’ve enjoyed this post and found some outfit inspiration for Spring – it’s definitely in the air! Do let me know what you think of the items I’ve selected and the outfits I’ve put together – it’s always nice to hear from you. Until next time! Please note, there are affiliate links on this page so if you click through and purchase an item, I may earn a small commission.